You know the "as soft as it gets" feeling? Yeah, well this is softer. Pick up the Chaser™ Kids Super Soft Love Knit Cupcakes for Breakfast Pullover and style her in ultimate comfort. Relaxed-fit sweatshirt crafted from a luxuriously-soft tri-blend fabrication. A fun Cupcakes for Breakfast screen print adorns the front. Crew neckline with a tagless collar for added comfort. Long raglan sleeves. Easy pullover design. Straight hemline. 49% polyester, 46% rayon, 5% spandex. Machine wash cold, tumble dry low. Imported. Measurements: Length: 23 1⁄2 in Product measurements were taken using size 12 Big Kids. Please note that measurements may vary by size. You know the "as soft as it gets" feeling? Yeah, well this is softer. Pick up the Chaser™ Kids Super Soft Love Knit Cupcakes for Breakfast Pullover and style her in ultimate comfort. 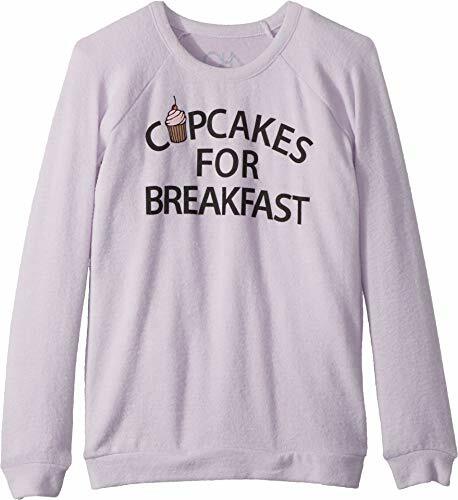 A fun Cupcakes for Breakfast screen print adorns the front. Long raglan sleeves. Easy pullover design. Straight hemline. 49% polyester, 46% rayon, 5% spandex. Machine wash cold, tumble dry low. Imported. Measurements: Length: 23 1⁄2 in Product measurements were taken using size 12 Big Kids. Please note that measurements may vary by size. If you have any questions about this product by Chaser Kids, contact us by completing and submitting the form below. If you are looking for a specif part number, please include it with your message.